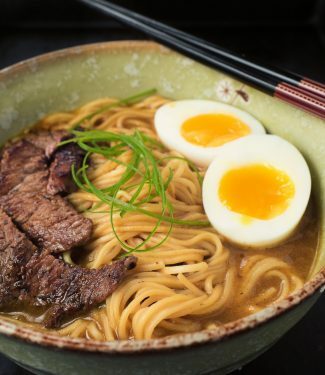 If you are looking for a quick ramen fix this one can be on the table 30 minutes after you walk into the kitchen. It’s rich, salty goodness in a bowl. And it’s dead easy. 30 minute curry ramen. Crazy delicious. Weeknight effort. I have a thing for Japanese food. Something about the simple perfection that is Japanese food just totally does it for me. I still remember the first time I tried the curry. In Japan curry is fast food. You pay for it at a machine. The machine spits out a token. Sit down and give them the token. Your meal appears. You don’t even need to talk. Japan is an absolutely fascinating place. And it has crazy good food. I came back from Japan determined to recreate it. First stop on the quest. I asked a Japanese buddy at work for a recipe. He said “We just use the cubes.” Cubes? What are cubes? What? Clearly more research required. How can anything good come from cubes? Next stop – I went to a casual Japanese restaurant and asked how they make the curry. “We use the cubes”. Huh? Unbelievable! But, genius that I am, I started to see the trend. Cubes. Everyone used the “cubes”. Not sure what the “cubes? are but clearly tiime to figure it out. Next stop – a Japanese grocery store. Turns out they have a wall of curry cubes. Literally. About 20 different boxes marked “curry”. So I tried it. And it was pretty much like I remembered it. So now I use the cubes too. Not always. But often. This blog is about near scratch cooking. Cubes don’t belong. My real tonkotsu ramen takes more than a day. No magic there. But I’m posting it anyway. Try it before you write me off. 30 minute curry ramen. Maybe it’s cheating. But it’s worth it. Seriously tasty stuff. 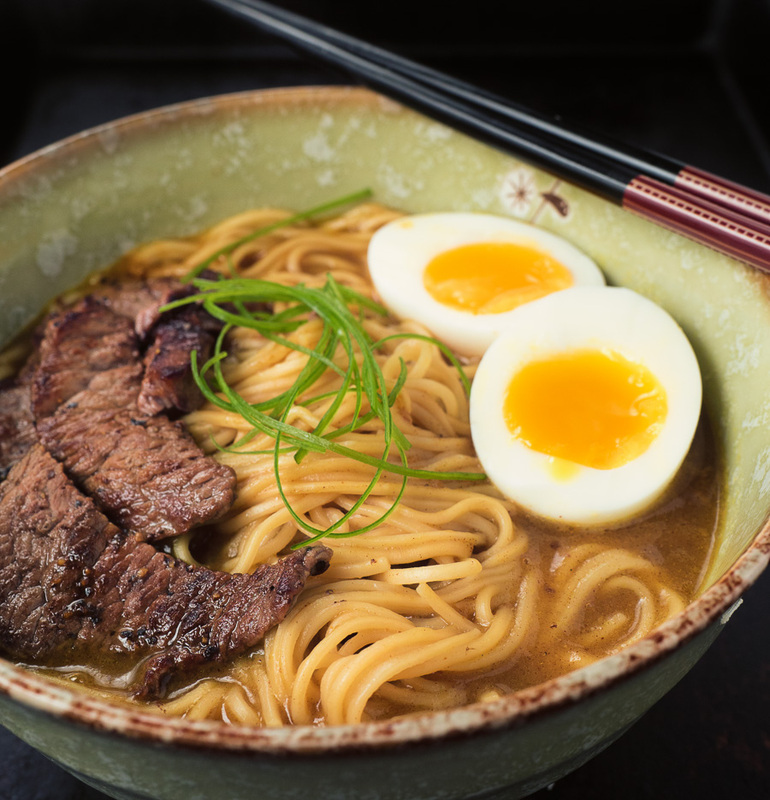 30 minute curry ramen is an easy way to get a delicious ramen fix on the table in half an hour. Slice the beef into 1/4 inch slices or cut the chicken into 3/4 inch cubes. Heat the oil in a pan large enough to hold the stock until it just shimmers. Fry the beef or chicken until just done. Remove. Gently lower the eggs into the boiling water (the water for the noodles) and cook for 6 1/2 minutes. After 6 1/2 minutes place the eggs in a bowl of ice water to cool. You want them to cool quickly to stop the yolks from hardening. Once they have cooled slice each egg in half lengthwise. Be careful. The yolks still have a bit of runny texture. Deglaze the pan with a bit of chicken stock then add about another cup of stock. Add the chopped cubes into the stock and bring to a boil. These things don't dissolve very well so you will have to chase them with a spatula. Once the cubes have dissolved add the remaining stock and simmer for about 4-5 minutes. While the stock simmers cook the ramen noodles per the instructions on the package. Divide the noodles across two bowls. 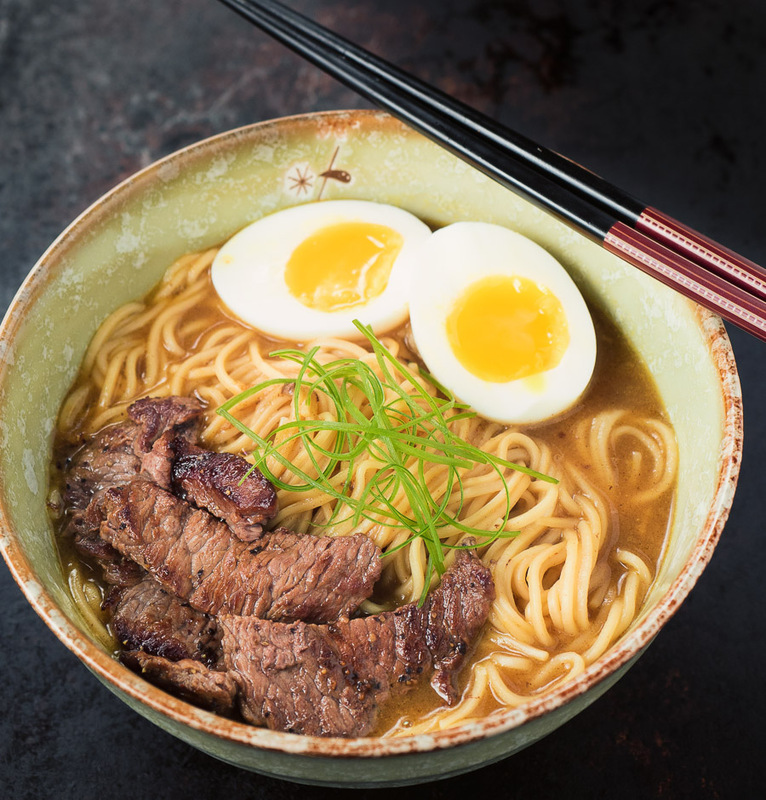 Arrange the beef or chicken overtop the noodles and pour half the broth into each bowl. Add the eggs, submerging slightly to warm them through. In japanese, main course, meat, noodles. Bookmark the permalink. The cubes had me scratching my head before I tried them but now I get it. I have a full on from scratch recipe as well but it’s not hugely better so I don’t do it often. A bit sweeter than the cubes. I LOVE your site. Unable still !! to get my email address straightened out. I cannot get notification of new recipes. My sister sends them to me . PLEASE HELP ! I believe when I subscribed There was a miss- key . Thank you. Theresa. This looks like such a quick and easy but tasty comfort food. And yes, sometimes ya gotta go with the cubes to save time… The ramen packets that you get in regular grocery stores (that cost like 25 cents) have all these unhealthy ingredients even without the dry seasoning packets but sometimes I just can’t get to the Asian market and reluctantly use them. Thank you so much for the alkinated spaghettini tip!! I had no idea. I love your blog and I love your mission! Well done. 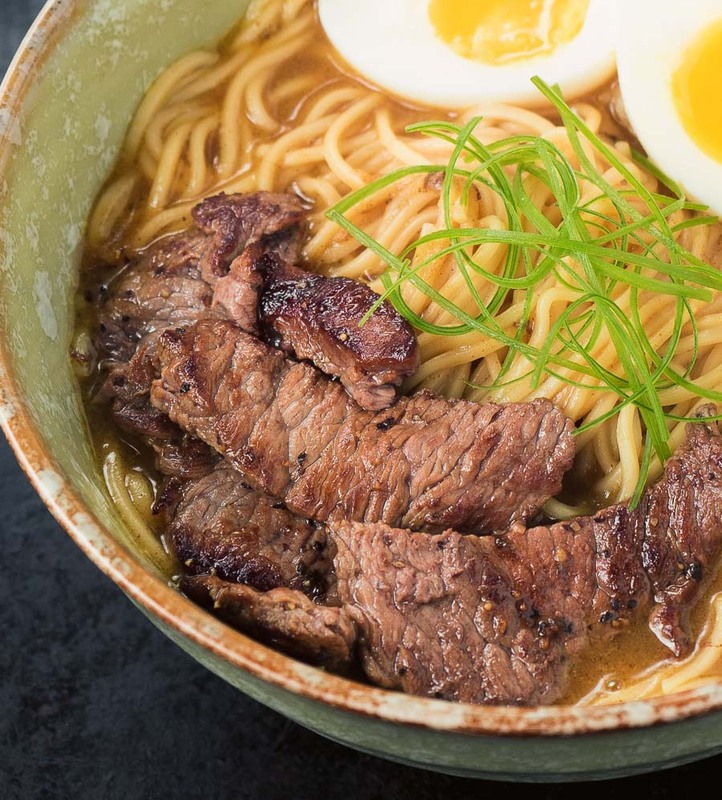 Grocery store ramen is completely different. Strangely tasty (in a super unhealthy way) but not at all the same. The alkalinated spaghettini works and most Asian shops have the actual noodles so there are alternatives. Thanks for the kind words Neena. Really appreciated.